This is a very simple but incredibly useful jig. The whole thing is made of 5/8″ thick MDF and is really solid. The base and rails should be long enough so the sliding rig can cover the entire wood to be planed. Mine is 4′ long, more than enough! The sliding rig should, well…, slide over the rails with ease. The MDF surfaces are convenient for this. They are smooth enough for sliding and rough enough to prevent unwanted movement. The side-rails are made from 2 pieces stacked together and can either be glued or screwed together (I started to glue them but realized that there was a lot space to cover and finally just screwed them). You can add more pieces (height) for thicker planks of wood. The rails are then attached to the main board with screws from under. The MDF router support-1 (see image) has a 3″ opening so the router bit can safely fit through. 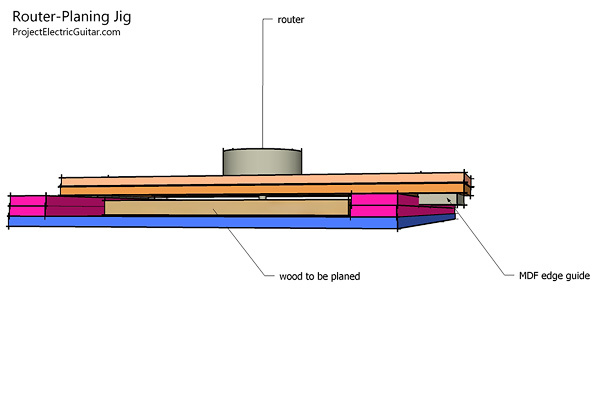 The MDF router support-2 (see image) serves 3 functions: i) doubles the thickness of the sliding rig so the rig doesn’t bend under the weight of the router; ii) the long edges guide the router along a straight line and iii) the short edges prevent the router from going too far and hitting the rails. That’s a good idea Mark. I have built something close to this but it’s not stable and easy enough, so now my bookmatched boards have slightly curved on the center,I will build with your plan and hope to correct my board.wish I see this post earlier…. Thank you.